Boat owners from Maine to Texas have a reason to become edgy in the late summer and fall: Each year, on average, two hurricanes will come ashore somewhere along the Gulf or Atlantic coasts, destroying homes, sinking boats, and turning people's lives topsy turvy for weeks, or even months. This year, who knows? Florida is struck most often, but every coastal state is a potential target. Experts predict that in the next 20 years there will be much more hurricane activity than has been seen in the past 20 years. Experts also fear that after a number of storm-free years, people in some of the vulnerable areas will be less wary of a storm's potential fury. But to residents of Charleston, South Carolina, crippled by Hugo in 1989, and people in Dade County, Florida, ravaged by Andrew in 1993, the hurricane threat won't soon be forgotten. 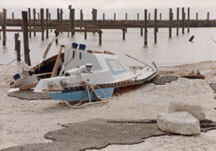 Boats ashore should be stored well above the anticipated storm surge, but even when boats are tipped off jackstands and cradles by rising water, the damage they sustain in a storm tends to be less severe than the damage to boats left in the water. Windage is also a consideration. If nothing else, reduce windage (see "Critical Points") as much as possible and make sure your boat has extra jackstands, at least three or four on each side for boats under 30' and five or six for larger boats. The jackstands must be supported by plywood and chained together. To reduce windage, some ambitious boat owners on the Gulf Coast dug holes for their sailboat keels so that they presented less windage. Smaller sailboats were laid on their sides. Recent storms have proven that high-rise storage racks are vulnerable in a storm's high winds. Several have been completely destroyed in recent hurricanes. If possible, boats on storage racks should be placed on trailers and taken home. Any boat in the water should be secured in a snug harbor (don't even think about riding out the storm at sea unless you're the skipper of an aircraft carrier). The trick is deciding which harbors will be still be snug if a hurricane comes ashore and which will be vulnerable. Storm surge—high water—is a major consideration. A storm surge of 10' or more is common in a hurricane, so a seawall or sandy spit that normally protects a harbor may not offer any protection in a hurricane. Crowded, rock strewn harbors are picturesque, but they may not be the best place to keep your boat in a storm. Rocks are hard on boats, should yours break loose, and in a crowded harbor the chance of another boat breaking loose and banging into your boat is that much greater. Finally, what is the bottom of the harbor like? 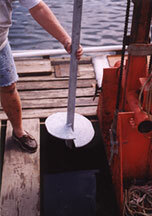 If you plan to anchor, check your charts to see how much water your boat will be anchored in. The best anchoring is usually in sand, followed by clay, hard mud, shells, broken shells, and soft mud. Also, water can sometimes be blown out of the harbor, leaving boats stranded briefly. If this happens, your boat would rather settle onto anything but rocks.